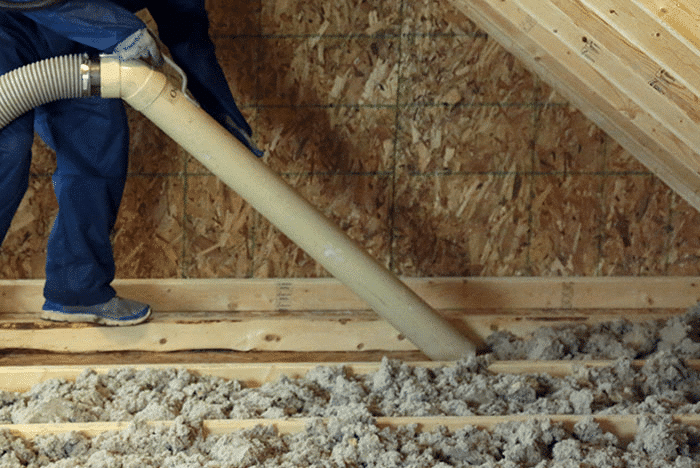 Traditional insulation like cellulose can be found in thousands of homes, but its popularity doesn’t mean it doesn’t have its problems. Cellulose insulation is the oldest form of home insulation available on the market today. It can be installed as either a loose-fill or blown-in insulation. While it may be one of the oldest materials, cellulose can still have a number of issues ranging from dust getting all over your home to the material settling leaving areas uninsulated. RetroFoam of Michigan has more than 15 years of experience insulating thousands of homes across the lower peninsula. While foam is all we do, we have insulated homes that have had cellulose insulation problems, so we know what to look for. In an effort to educate our customers, we have compiled a list of five cellulose insulation problems and how to fix them. Cellulose settles, leaving your home open to air movement. Modern cellulose settles up to 20 percent, according to House Energy. Cellulose in walls can also sometimes separate over time causing a gap – this is called bridging. Solution: To ensure your home is covered the way you want it to be for insulation, it is important that you maintain the cellulose insulation in your home. You may need to either rake the insulation to ensure it is even or install more to ensure you have the coverage that you need. Cellulose insulation must be kept dry. Cellulose insulation can absorb up to 130 percent water by weight. Cellulose can get wet due to condensation, lack of air seal, or leaks in the home. The material dries very slowly after it absorbs the water which causes it to deteriorate and settle. The water will also destroy the chemical fire treatment used in the material. Solution: It is important to ensure that the cellulose insulation stays dry. If the material becomes wet, your best option will be to replace it. Another option is to choose an insulation material that doesn’t retain water. Dense packed cellulose insulation can get everywhere. Dense packed cellulose insulation can spill into the house through any openings in the wall cavity, like electrical sockets. Homes with furnace duct systems can expect some of the cellulose dust to be recirculated throughout the home. Solution:Great care should be taken when installing dense pack cellulose insulation, but honestly the dust will still get everywhere. The best option is to cover any openings and limit the amount of dust that will escape. Vents can cause the insulation to drift and allergens to become trapped in the material. If you use loose-fill cellulose insulation on the attic floor, the air flow from the vents will cause the material to drift, leaving spaces in the attic uninsulated. Also, as that outside air moves through the cellulose, pollen, bacteria, and mold spores can cling to it. Solution: Cellulose insulation should be monitored at a minimum of once a year to make sure it is level. You can rake the material to even it back out, but sometimes you may need to add more cellulose to get the coverage you need. Cellulose is very difficult to work with. Cellulose insulation is one of the most difficult materials to work with if you need new wiring or alterations to the home. When a puncture is made in the cavity where the cellulose has been installed, the material just pours out of the hole. Solution: The only option would be to replace the insulation that spills out, unless you decide to use an insulation that will allow for home improvement projects. You have now gone through the problems associated with cellulose insulation, so you might be thinking you want to go with a different material. If you would like more information on the benefits of foam insulation for your home, check out the learning center on our website.